The tissue selectivity of Hydro-Jet allowed precise cutting through the renal parenchyma in a virtually bloodless field. The remaining vessels were then coagulated under direct vision. Similarly, renal collecting system was preserved by Hydro-Jet and selectively transected allowing proper closure of the collecting system. Although excellent results were obtained using this technique, the need for hilar occlusion has been debated. In summary, current experimental data support that temporary hilar control is advantageous for better visualization during laparoscopic partial nephrectomy. Other factors, such as extent and location of parenchymal segments to be resected and tissue vascularity are, however, important variables, which cannot be addressed precisely by experimental protocols. Only a well-performed clinical study can address these issues. bar was utilized for cutting of the parenchyma. Temporary hilar control was obtained during this study. Coagulation was applied using a bipolar probe. Laparoscopic partial nephrectomy was successful in all animals with no need for conversion to open surgery. No surgical complications including vascular injuries secondary to dissection occurred. There was no significant intraoperative bleeding. The mean dissection time was 45 ± 9 minutes and the mean warm ischemia time was 17 ± 3 minutes. The average amount of normal saline used during each procedure was 195 mL (range, 250-350 mL). Histological evaluation of renal parenchyma did not reveal any acute changes such as necrosis attributable to hydro-jet use. A clear view of the operative field was maintained at all times. In a recent experimental study utilizing the Helix Hydro-Jet device, no hilar control was obtained. 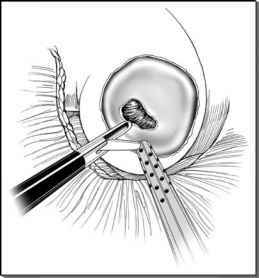 Using lower pressures (16-22 bar), laparoscopic partial nephrectomies were successful (17). It appears that using various pressures, partial nephrec-tomies can be performed with or without temporary hilar control with respective advantages and disadvantages (18). To address the issue of hilar control and optimal pressure for partial nephrectomy, we performed further experiments in an ex vivo and in vivo porcine model using the Helix Hydro-Jet (18,19). In the ex vivo model, a continuous saline perfusion of renal artery was performed (Fig. 4). A pressure range of 180 to 360 psi (14-25 bar) was utilized. In this model, our results indicated that overall in unper-fused kidney, lower pressures were as effective. Optimal pressure in perfused kidney appeared to be 305 psi (21 bar) (Fig. 5). In vivo model, a pressure range of 225 to 290 psi (16-20 bar) with vascular control and a pressure range of 225 to 360 psi (16-25 bar) without vascular control appeared to be optimal for laparoscopic partial nephrectomy. Furthermore, our results indicated that resection of renal parenchyma without hilar control was associated with small vessel hemorrhage from cortical tissue, which may obscure the operating field although larger vessels are preserved. Visualization was improved with vascular control. The combination of Hydro-Jet cutting with bipolar cautery for control of isolated blood vessels was ideal. In summary, current experimental data support that temporary hilar control is advantageous for better visualization during laparoscopic partial nephrectomy. Other factors, such as extent and location of parenchymal segments to be resected and tissue vascularity are however important variables, which cannot be addressed precisely by experimental protocols. Only a well-performed clinical study can address these issues.